We sometimes hear potential customers say “We like to do our own SEO and organic search work – we can do what YourAmigo does”. Yes, it is true that you can do your own SEO (with or without the help of an SEO Agency). But, YourAmigo doesn’t do SEO. Can you afford to build a webpage that might only receive one click in a month? We can, only because of the huge investment we have made in technology development (and before that inside a university), spanning the past 20 years and with hundreds of person-years of research and development. You might reasonably ask – OK, but who cares about a webpage that only receives one click in a month – that wouldn’t change anything, would it? Well, somewhat surprisingly, our data proves otherwise and clearly shows the immense value of one-click phrases. We have conducted studies that show that by utilizing our services to exploit the ultra-long tail, we can generate webpages that are completely uneconomic for anyone else to build but YourAmigo, but that also have a huge impact on your revenue. 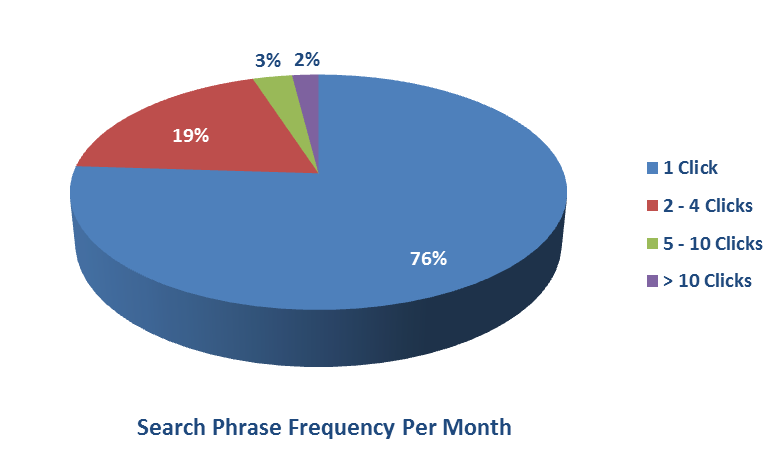 In a landmark study we captured a huge amount of data across our customers, and showed a breakdown of how often a search phrase was used in a month to get to our pages – a huge 76% of phrases were only used once in a month, and 95% of the phrases were used less than 4 times in a month – please see the detailed results below. Prior to Google suppressing users’ organic search keywords through its secure search, YourAmigo captured real keyword combinations over more than 15 years (based on terms that searchers entered into search engines) to create a huge, proprietary database that allows YourAmigo to optimize for organic search listings and the ultra-long tail. Our technology and dedicated quality assurance teams are able to efficiently optimize the ultra-long tail, creating thousands of new pages for very large websites in a matter of weeks, giving our customers a major uplift in traffic and revenues. So, in summary, YourAmigo can supplement your SEO by building webpages that can drive huge numbers of new customers, but are uneconomic for others to build. Moreover, these pages are highly tailored to specific user queries, resulting in a great user experience, improved conversion rates and higher basket values.